There has been an increasing emphasis on the role of doctors in the prevention and management of alcohol-related harm; , however, this will depend on their level of use. This study is aimed at looking at the pattern of alcohol use and predictors of hazardous drinking among doctors in a hospital setting. This is a cross-sectional survey involving all the doctors in the service of State University Teaching Hospital in Ado-Ekiti, Nigeria. Data were collected using a pretested, semi-structured questionnaire incorporating sociodemographic characteristics of the participants. Alcohol use disorder identification test (AUDIT) questionnaire and the 12 items General Health Questionnaire (GHQ-12) were used to assess level of alcohol use and psychological well-being, respectively. A set of questionnaires containing sociodemographic questionnaire, GHQ-12 and the AUDIT was given to all consenting doctors. The AUDIT, a self-rated 10-item questionnaire was used to assess harmful and hazardous alcohol use. It was developed by Saunders et al. as part of the WHO collaborative project on the detection and management of alcohol-related problems in Primary Health Care. The AUDIT at a cut-off of 5 and above could clearly identify participants with alcohol-related problems in Nigeria. In this study, a score of 0-4 on AUDIT was rated moderate alcohol use while a score of 5 and above was rated hazardous use. GHQ-12 was used to assess their psychological well-being/distress within the past few weeks. Each item on the scale has four responses from "better than usual" to "much less than usual." In this study, the GHQ scoring method (0-0-1-1) was chosen against the Likert scale of 0-1-2-3. This particular method is believed to help eliminate any biases which might result from the respondents who tend to choose responses 1 and 4 or 2 and 3, respectively. , The total score was obtained by adding all scores on each item on the scale. The mean GHQ score for the population of respondents was taken as a rough indicator for the best cut-off point as suggested by Goldberg et al. As such, with a mean GHQ score of 0.89 ± 1.63 for this sample, a cut-off point of 2 was used to determine the respondents' level of psychological well-being. Prior to data collection, permission to carry out the study was obtained from the Ethics and Research Committee of the Hospital. The instructions for completion of the questionnaires, a consent form, and a declaration on the anonymity and confidentiality of the respondents was attached to the questionnaire. Statistical analyses were done using the Statistical Package for Social Sciences (SPSS for Windows, Version 16.0. Chicago, SPSS Inc. USA). A descriptive statistics was performed to determine the distribution of characteristics of all the variables studied, including the participants' alcohol use as assessed by AUDIT and level of psychological well-being as assessed by GHQ-12. The total, means and standard deviation for the GHQ and AUDIT scores were calculated. Chi-square tests with Yates correction were used to describe the relationship between respondent's characteristics and AUDIT scores as appropriate. The level of significance was set at P < 0.05. Of the 135 respondents who were given questionnaires, 122 returned the completed questionnaires, thus giving a response rate of 90.4%. The mean age of the participants was 35.65 ± 8.35, the mean years of practice was 8.52 ± 7.91, the mean AUDIT and GHQ scores were 1.14 ± 2.87 and 0.89 ± 1.63, respectively. There was a correlation between GHQ score and AUDIT scores (P = 0.000). [Table 1] summarizes the sample characteristics. The majority of doctors were male (61%), younger than 40 years (79%), married (68.9%), had only practiced for <10 years (68%) and in nonsurgical specialty (68%). As shown in [Table 2], most of the doctors (69.7%) did not drink alcohol in the past year, 28 (23%) were moderate drinkers (22 males and 6 females), 8 (6.6%) drank hazardously and one harmful drinker. None of the female respondents drank hazardously. [Table 3] shows the relationship between sample characteristics and hazardous alcohol use. Although all those who used alcohol hazardously were men, the relationship between gender and hazardous drinking was not statistically significant (P = 0.201). Similarly, there is no significant relationship between marital status, year of practice, religion, specialty of practice, the presence or absence of chronic illness, and hazardous alcohol use. Nonetheless, those who were older than 40 were more likely to use alcohol hazardously, and this was statistically significant (P = 0.017). As can be seen in [Table 4], of those who admitted experiencing current stressor (either relationship/marital, career, health or financial), a higher proportion (18.2%) were hazardous drinkers compared with 3.4% of those who were not experience any stressor and this was statistical significant (P = 0.012). Majority of the participants (66%) were experiencing stress in the area of their career (not in the table). Analysis of GHQ score in relation to hazardous alcohol use shown that a higher proportion of those who had GHQ score above average used alcohol hazardously. The association between GHQ scores and hazardous alcohol use was statistical significant (P = 0.000). Hospital doctors play a significant role in the prevention of harmful drinking in the society, however, their disposition to alcohol use will influence significantly this role. In Nigeria, however, there are limited studies that have looked at the pattern of alcohol use among hospital doctors. This study looked at the pattern of alcohol consumption and the predictors of hazardous drinking among hospital doctors. Alcohol use was low among doctors studied compared to other countries where the prevalence of alcohol use was close to 100%. , In our study, over 60% were abstainers with only approximately 7% either drinking hazardously or harmfully. This finding is in keeping with what was earlier reported by Issa et al. in another hospital in Nigeria  and Akvardar et al. in Turkey. Issa et al. reported that over 70% of doctors in their study were abstainers with only about 4% constituting hazardous and harmful drinkers. However, this is rather at variance with most findings in most Western countries. ,,,, For example, in a study by Rosta in Germany,  majority were moderate drinkers, only 9.5% were abstainers and with about 20% being hazardous drinkers similar to 18.5% reported by Joos et al. in Belgium. Nonetheless, the proportion of doctors who were risky drinkers is lower compared with what obtained in the general population and patient population in Nigeria. , There are studies suggesting that risky drugs and alcohol use in practicing physicians are no greater than in the general public or other professionals ,, or even lower. , The lower rate of alcohol use reported among doctors may have resulted from their knowledge of negative consequences of alcohol, hence caution in the use of alcohol. Several factors have been reported to influence hazardous drinking among doctors. In general, gender has been a recurrent factor influencing hazardous alcohol use generally. , In this study, none of the females used alcohol hazardously; nevertheless, there was no significant relationship between hazardous alcohol use and gender. Similarly, other studies have reported a lower rate of hazardous/harmful drinking among female doctors ,, and other population. The lower number of females with alcohol use and the absence of female gender reported with hazardous alcohol use in this study may have been influenced by culture and religion. In Nigerian culture, where this study was carried out, it is largely permissive of men to drink alcohol rather than women. Again, Nigerian societies have some prejudice against women who drink alcohol especially those who consume it in excess. This may also affect the degree with which women report their alcohol use. Besides gender, age is an important factor that influences harmful alcohol use. ,,, In this study, more respondents above 40 years had a higher rate of hazardous drinking compared to those below 40 years. In contrast, some authors have reported an association between younger age group and hazardous alcohol use. , Some other authors, however, had reported findings in keeping with our result. ,, Possible explanation for this may be that older doctors may have been exposed to longer periods of alcohol use resulting in an increment in quantity consumed over time. Other plausible explanation is the possibility that older doctors have more money and time at their disposal; further studies need to explore this. Hazardous drinking among hospital doctors appears to be essentially a problem of the male gender, especially among the older ones. Stress and other forms of psychological distress may play a significant role in predicting hazardous drinking among doctors. Therefore, efforts to reduce hazardous drinking among hospital doctors should focus on alleviating all forms of stress particularly career related. The small sample size and the fact that the sample was drawn from just one center make it difficult to generalize the findings of this study to the general population of doctors in Nigeria. The strength of our findings lies in the fact that it adds to the body of knowledge about alcohol use among doctors in this environment. We acknowledge all the doctors who took part in the study. Babor T, Campbell R, Room R, Saunders J, editors. Lexicon of Alcohol and Drug Terms. Geneva: World Health Organization; 1994. Reid MC, Fiellin DA, O'Connor PG. Hazardous and harmful alcohol consumption in primary care. Arch Intern Med 1999;159:1681-9. Rosta J. Prevalence of problem-related drinking among doctors: A review on representative samples. Ger Med Sci 2005;3:Doc07. Frank E, Rimer BK, Brogan D, Elon L. U.S. women physicians' personal and clinical breast cancer screening practices. J Womens Health Gend Based Med 2000;9:791-801. Rosta J. Physicians' interest in preventive work in relation to their attitudes and own drinking patterns: A comparison between Aarhus in Denmark and Mainz in Germany. Addict Biol 2002;7:343. Harrison D, Chick J. Trends in alcoholism among male doctors in Scotland. Addiction 1994;89:1613-7. Brook D. Doctors neglect their own alcohol problems as well as those of their patients. BMJ 1997;315:1299. Romelsjö A, Hasin D, Hilton M, Boström G, Diderichsen F, Haglund B, et al. The relationship between stressful working conditions and high alcohol consumption and severe alcohol problems in an urban general population. Br J Addict 1992;87:1173-83. Gray JD, Bhopal RS, White M. Developing a medical school alcohol policy. Med Educ 1998;32:138-42. Bennett J, O'Donovan D. Substance misuse by doctors, nurses and other healthcare workers. Curr Opin Psychiatry 2001;14:195-9. Bohigian GM, Croughan JL, Sanders K, Evans ML, Bondurant R, Platt C. Substance abuse and dependence in physicians: The Missouri Physicians' Health Program. South Med J 1996;89:1078-80. Issa BA, Yussuf AD, Abiodun OA, Olanrewaju GT, Kuranga TO. Hazardous alcohol use among doctors in a Nigerian tertiary hospital. West Afr J Med 2012;31:97-101. Gureje O, Degenhardt L, Olley B, Uwakwe R, Udofia O, Wakil A, et al. A descriptive epidemiology of substance use and substance use disorders in Nigeria during the early 21 st century. Drug Alcohol Depend 2007;91:1-9. Kenna GA, Wood MD. Alcohol use by healthcare professionals. Drug Alcohol Depend 2004;75:107-16. Fleming MF, Mundt MP, French MT, Manwell LB, Stauffacher EA, Barry KL. Benefit-cost analysis of brief physician advice with problem drinkers in primary care settings. Med Care 2000;38:7-18. Marlatt GA, Witkiewitz K. Harm reduction approaches to alcohol use: Health promotion, prevention, and treatment. Addict Behav 2002;27:867-86. Raistrick D, Heather N, Godfrey C. Review of the Effectiveness of Treatment for Alcohol Problems. London, UK: National Treatment Agency for Drug Abuse; 2006. Saunders JB, Aasland OG, Babor TF, de la Fuente JR, Grant M. Development of the Alcohol Use Disorders Identification Test (AUDIT): WHO collaborative project on early detection of persons with harmful alcohol consumption - II. Addiction 1993;88:791-804. Adewuya AO. Validation of the alcohol use disorders identification test (audit) as a screening tool for alcohol-related problems among Nigerian university students. Alcohol Alcohol 2005;40:575-7. Goldberg DP, Williams P. A User's Guide to the General Health Questionnaire. Windsor UK: NFER-Nelson; 1988. Zulkefly NS, Baharudin R. Using the 12-item general health questionnaire (GHQ-12) to assess the psychological health of Malaysian college students. Glob J Health Sci 2010;2:73-80. Goldberg DP, Oldehinkel T, Ormel J. Why GHQ threshold varies from one place to another. Psychol Med 1998;28:915-21. Birch D, Ashton H, Kamali F. Alcohol, drinking, illicit drug use, and stress in junior house officers in north-east England. Lancet 1998;352:785-6. Hughes PH, Brandenburg N, Baldwin DC Jr, Storr CL, Williams KM, Anthony JC, et al. 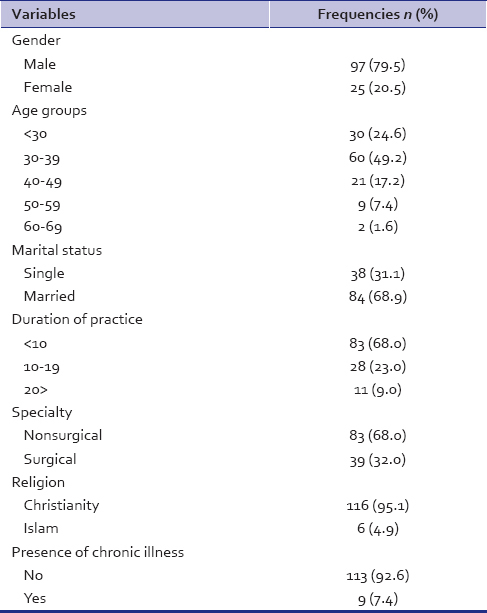 Prevalence of substance use among US physicians. JAMA 1992;267:2333-9. Rosta J. Hazardous alcohol use among hospital doctors in Germany. Alcohol Alcohol 2008;43:198-203. Roster J. Drinking patterns of doctors: A comparison between Aarhus in Denmark and Mainz in Germany. Drugs educ Prev Policy 2002;9:367-76. Sebo P, Bouvier Gallacchi M, Goehring C, Künzi B, Bovier PA. Use of tobacco and alcohol by Swiss primary care physicians: A cross-sectional survey. BMC Public Health 2007;7:5. 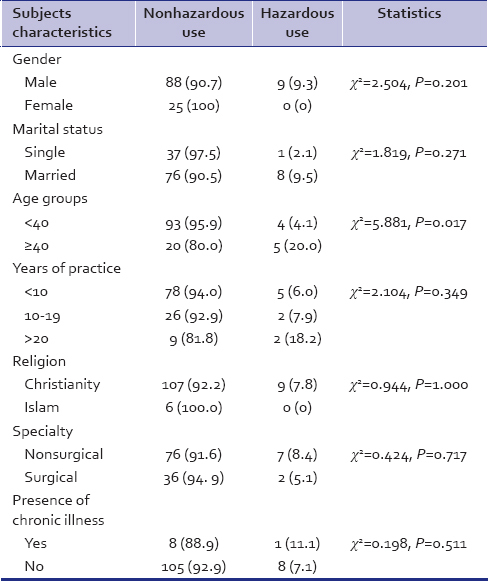 Joos L, Glazemakers I, Dom G. Alcohol use and hazardous drinking among medical specialists. Eur Addict Res 2013;19:89-97. Obadeji A, Oluwole LO, Dada MU, Ajiboye AS. Pattern and predictors of alcohol use disorders in a family practice in Nigeria. Indian J Psychol Med 2015;37:75-80. Weir E. Substance abuse among physicians. CMAJ 2000;162:1730. McAuliffe WE, Rohman M, Breer P, Wyshak G, Santangelo S, Magnuson E. Alcohol use and abuse in random samples of physicians and medical students. Am J Public Health 1991;81:177-82. McGovern MP, Angres DH, Leon S. Characteristics of physicians presenting for assessment at a behavioral health center. J Addict Dis 2000;19:59-73. Rosenfield S, Vertefuille J, McAlpine DD. Gender stratification and mental health: An exploration of dimensions of the self. Soc Psychol 2000;63:208-23. John A, Barman A, Bal D, Chandy G, Samuel J, Thokchom M, et al. Hazardous alcohol use in rural southern India: Nature, prevalence and risk factors. Natl Med J India 2009;22:123-5. Juntunen J, Asp S, Olkinuora M, Aärimaa M, Strid L, Kauttu K. Doctors' drinking habits and consumption of alcohol. BMJ 1988;297:951-4. Babalola E, Akinhanmi A, Ogunwale A. Who guards the guards: Drug use pattern among medical students in a Nigerian university. Ann Med Health Sci Res 2014;4:397-403. Foulds J, Wells JE, Lacey C, Adamson S, Sellman JD, Mulder R. A comparison of alcohol measures as predictors of psychological distress in the New Zealand population. Int J Alcohol Drug Res 2013;2:59-67. Balogun O, Koyanagi A, Stickley A, Gilmour S, Shibuya K. Alcohol consumption and psychological distress in adolescents: A multi-country study. J Adolesc Health 2014;54:228-34. Peltzer K. Depressive symptoms in relation to alcohol and tobacco use in South African university students. Psychol Rep 2003;92:1097-8. O'Donnell K, Wardle J, Dantzer C, Steptoe A. Alcohol consumption and symptoms of depression in young adults from 20 countries. J Stud Alcohol 2006;67:837-40. Lucas N, Windsor TD, Caldwell TM, Rodgers B. Psychological distress in non-drinkers: Associations with previous heavy drinking and current social relationships. Alcohol Alcohol 2010;45:95-102. Marchand A, Demers A, Durand P, Simard M. The moderating effect of alcohol intake on the relationship between work strains and psychological distress. J Stud Alcohol 2003;64:419-27. Rodgers B, Korten AE, Jorm AF, Christensen H, Henderson S, Jacomb PA. Risk factors for depression and anxiety in abstainers, moderate drinkers and heavy drinkers. Addiction 2000;95:1833-45. Markman Geisner I, Larimer ME, Neighbors C. The relationship among alcohol use, related problems, and symptoms of psychological distress: Gender as a moderator in a college sample. Addict Behav 2004;29:843-8.